Forgive the slight repetition – I’ve got a thing for button-down(up?) dresses at the moment. Two makes in a row, and two more to come! I think it comes down to a combo of my distaste for zips (yes, sewing fifteen buttons and buttonholes is somehow preferable) and a love of the shirtwaist look but actually disliking the whole collar part on myself. 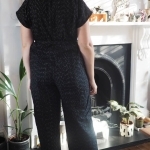 If it helps, this isn’t another Darling Ranges at least – it’s a wee hack of the new By Hand London Holly Jumpsuit. I’m by no means anti-playsuit (I love View 1 of the pattern as it is), but decided to hack the Holly onto a simple skirt for a much more everyday-wearable garment. The skirt is just a wide gathered rectangle with the button placket continued right down the front. Easiest hack ever. I had to make a couple of minor fit adjustments to the bodice itself, similar to those I made for the BHL Anna: taking a wedge out of the back neck, raising the waistline a bit and a swayback adjustment. I did these on the fly because I was sewing this dress up chez Tilly but I’ve now transferred them to my paper pattern for next time. 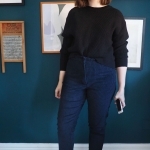 I also sized up to a 14 because I like more ease than is built in (props to any pattern company that, like BHL, gives finished garment measurements so you can work this out ahead of time!). 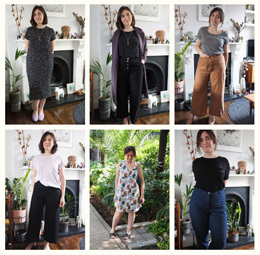 The four front darts and two back darts all hit the right places and give good shaping – it’s a slightly more tailored look than the casual babydoll of Darling Ranges. Good to have button-down dress options, right? I actually pinched an idea from Darling Ranges and used narrow bias binding to finish the neckline instead of the included facings – if I can avoid a facing, I will. The neckline is such a pretty shape: the perfect collarbone-showing off scoop. The sleeves have a sweet turn-back effect cuff using a separate pattern piece – a lovely detail that gets kind of lost in this print. It would be cute to do them in a complementary fabric like the envelope model. This fabric was an eBay scoop, just a cheap poly but it’s got nice drape and a pretty rad distressed triangle print with flashes of colour. I had some small coral buttons in my stash that matched one of the colours quite well so on they went. I tend to add more buttons than recommended because I’m scared of malfunctions… also I secretly quite like sewing buttonholes with my one-step foot. I also just got a button-sewing foot which makes the whole process dead speedy. 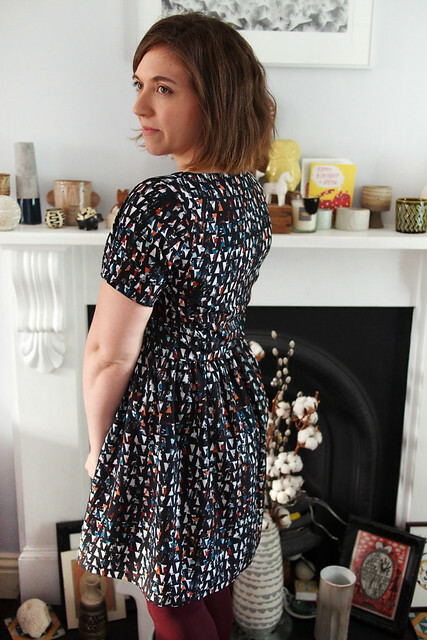 This dress was a really fun sew and I’ve already worn it twice – it’s a nice one to pair with coloured tights as I’ve got lots of accent colours to pick from! Holly is such a lovely pattern and, seemingly like all BHL patterns, ripe for a bit of hacking fun. 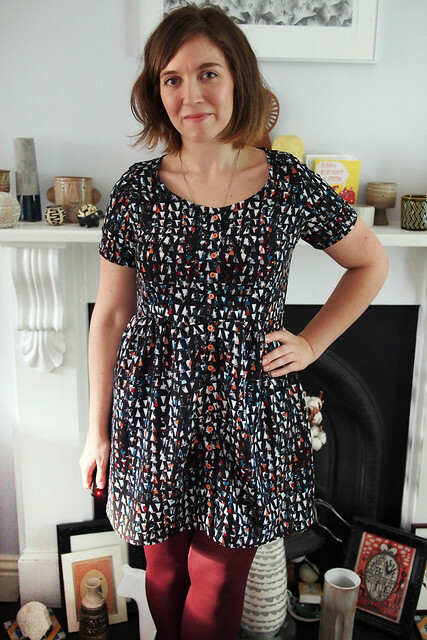 BHL are just about to kick off the official Holly sewalong – and watch this space if you want a bit more guidance on how to make this dress hack as I’ll be sharing a full tutorial (and my second take on this pattern!) next week. Anyone else take a button over a zip any day? Love this! I haven’t bought the Holly pattern yet myself, but I’ve been thinking about doing a similar hack myself when I do. Like you, I love the shirt dress look, but hate collars! Fab fabric too, you have a real knack of picking good prints. Ooh very cute! Nice to see a bit of color on you as well! :) Zips work better for me than buttons but I think for this style of dress buttons are the only way to go! Cute dress. 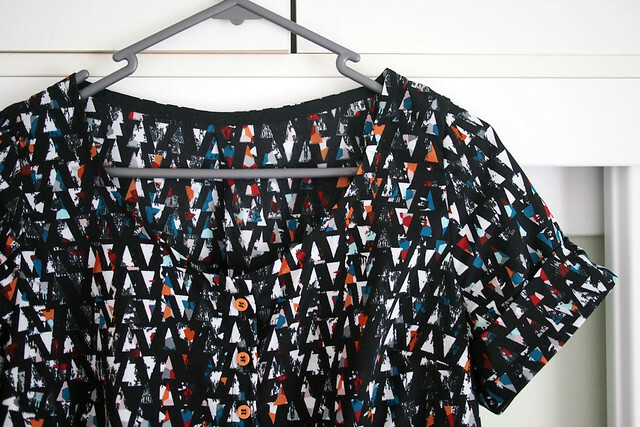 Love the print… which ebay seller did you purchase from please? That print is absolutely wonderful!! So in love with it! This is SO cute! I was thinking of waiting on the Holly because of winter (it’s already REALLY cold where I live, like 10 degrees) but with dress hack options, and especially with this neckline… I’m thinking you may have just won me over to purchasing! 10 degrees, yikes! I think I’ll wear this all autumn with tights and lace-ups. You could even make it in a plaid flannel or light wool… cosy. Very nice dress in a very cool print! I dislike zips too because they tend to chew on my scarfs and buttons are prettier anyway. such a great dress! i rather like buttons and buttonholes myself. i used to dread them, but when i upgraded my sewing machine from a basic 70’s metal machine to a modern pfaff with a one-step buttonhole function (with a handy dany feet in wiich you clip in the button, so that the buttonholes always are the right size! ), i am happy to put dozens of buttons on all my makes! 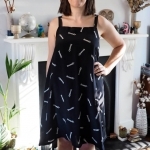 I really love this dress, it is exactly what I would like to do with the Holly pattern whenever I get my hands on it as I have to admit jumpsuits and playsuits are not for me. Really love the fabric pattern too (and colour of your tights!). As for buttons – I have a bit of a fear of them and since I started sewing about 5 years ago I have been avoiding them as much as possible! Basically my experience has resulted in perfect practice buttonholes followed by my machine eating my ‘real’ fabric every time! I’m now scared to try again! Ugh yeah every time! I literally haven’t had a project where I haven’t had to unpick at least one messed-up buttonhole. Cute indeed! I too have been suffering zipper avoidance and recently realised I haven’t seen one since January! Coward I am! Current project has one so no excuses….. Being small-shouldered I find I can usually just eliminate back zips and wriggle in and out – now that’s lazy. i love this dress! 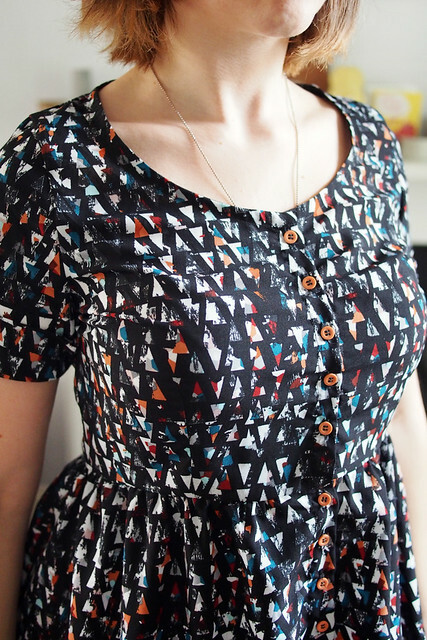 that fabric is so cute, i love the little triangles! ya know i don’t mind making buttonholes, but i hate sewing on buttons. i’m mostly okay with inserting zips, but i still dread it–it takes me way longer than it reasonably should! Do you sew buttons by hand? I think I might share my machine method, it’s really taken the pain out. Wow – that suits you so well! Love what you’ve done with the Holly Jumper bodice. Such a perfect “golden autumn” dress. Personally, I’m a button coward – my current machine just wouldn’t do the holes propperly and I’m shying away from hand sewing them. Planning to make the Grainline Alder Shirt Dress – but maybe with a fake button band and zipper on the side?! ;) – Or I should just learn how to sew those button holes by hand (or get a propper machine). 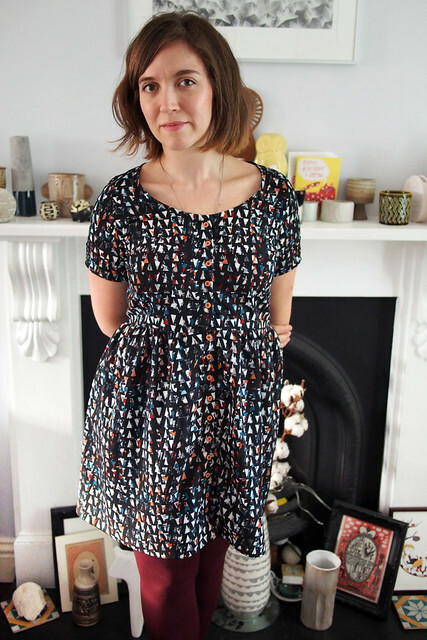 Cheap fabric or not, that is such a darling print! Your projects always look fantastic! Please impart to me your love of buttons and buttonholes! I hate them! Even with a one-step buttonhole on my machine, I don’t think I have EVER had a project when buttonholes haven’t caused me a nightmare! I am desperate to make a Hawthorn, but I’ve been putting it off for yonks due to my fear of buttons and buttonholes! Give me an invisible zip any day! 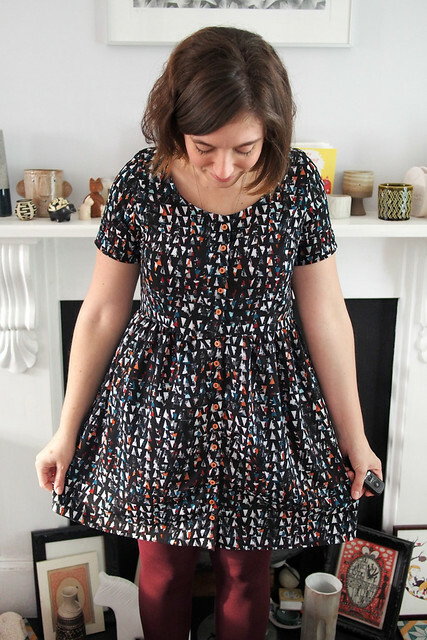 This is a lovely dress – I love the combination of fabric and buttons. And I agree, a dress version does make it much more wearable than a playsuit.